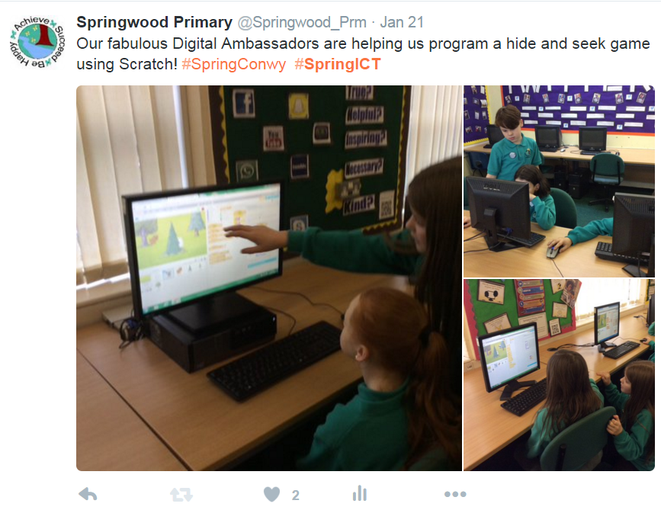 Search #springICT on our Twitter to find out more about our amazing use of ICT in our school. 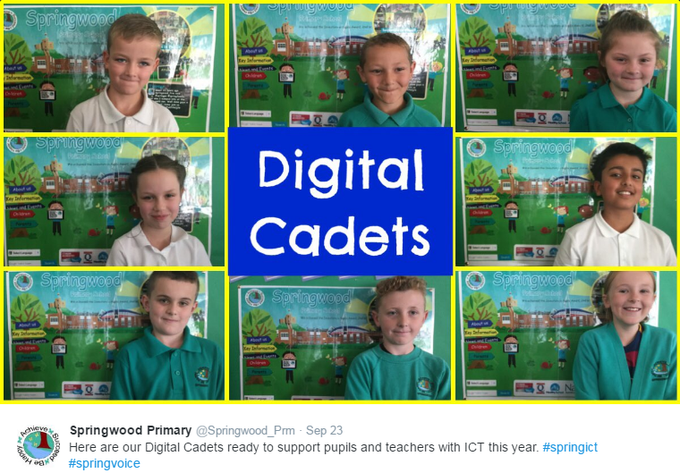 Mr Dowd and the E-Cadets will be working with classes to develop digital skills across Literacy and Numeracy activities whilst also having serious amounts of fun. We made a podcast. Mrs Hoffer said we can have ICT morning on the 23rd November. Next steps - Arrange plans for what to do on the ICT morning. We came up with an action plan. Click here to watch our video. 1. 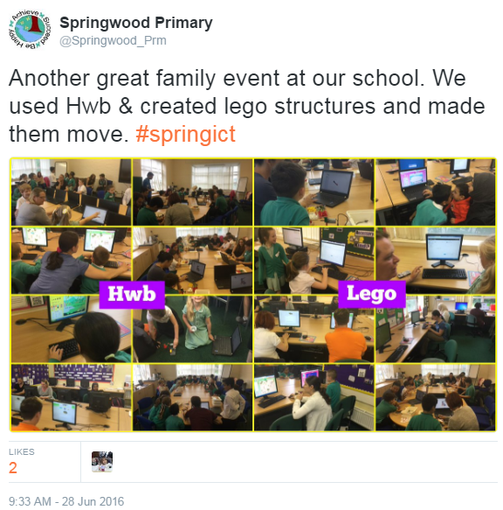 Every pupil using Hwb to support their learning. 2. All pupils and staff understanding the importance of E-safety. 3. More opportunities for ICT open afternoons. 4. 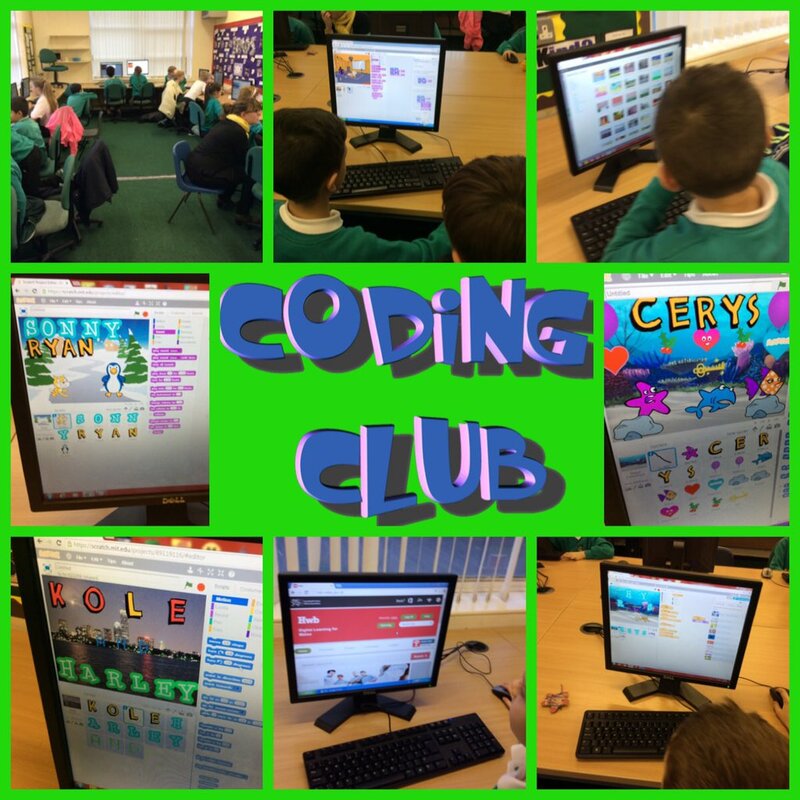 All pupils using Bug Club and Mathletics to support their learning. Next steps - arrange ICT e-safety week. Arrange a time and date for an ICT open afternoon with Mrs Hoffer. We have some new members. Next steps - Meet to come up with an action plan for the year. We visited Barry Island. We learnt all about Hwb. We learnt about discussions, blogging, wikis, e-mailing and JIT 5. Click the link for a podcast about it. Next steps - Use the ICT afternoon to train pupils and parents on these subjects in Hwb. We also plan to train parents and pupils on the Lego coding equipment. Finally, we plan on using Hwb surveys to survey groups on e-safety. We met with all the school groups and discuss how we help the school. 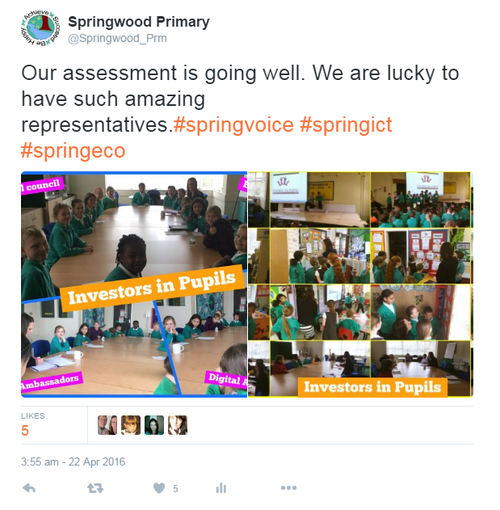 We then met the Investors in Pupils assessor and spoke to her about all the things we do. 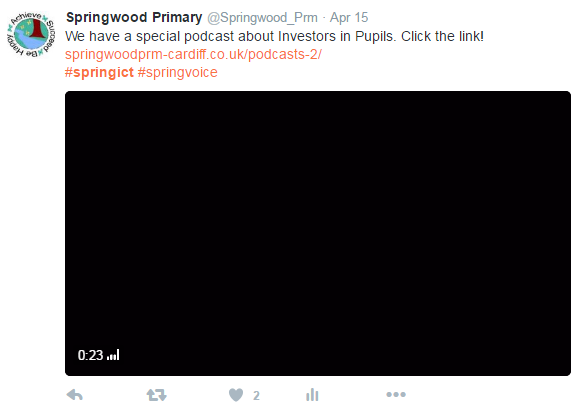 We made a special Investors in Pupils podcast. Click the picture for the link! Here is a picture of some Year 5 Digital Ambassadors training their class on using the Lego Mindstorms. Next steps - Train more adults and children in this. Discussed with the pupils the 3rd Millennium Award. Showed them the video we have made and discussed any changes they would like to make. Lots of new ideas about how we can make it better, they were impressed with how we used videos in the past to help make the video. Mr Dowd discussed the possibility of having a web development club (Web Dev Club), Mr Dowd asked the pupils to go back to their classes to discuss if people would be interested in the club. 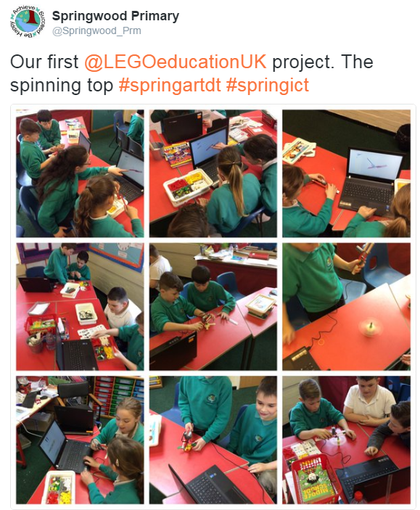 Next steps - Year 6 to continue to work with Year 2 on WeDo Lego kits. Mr Dowd and the DA had a chat about Coding club. Mr Dowd said he would help run the club as long as some of the DA came along to help out. 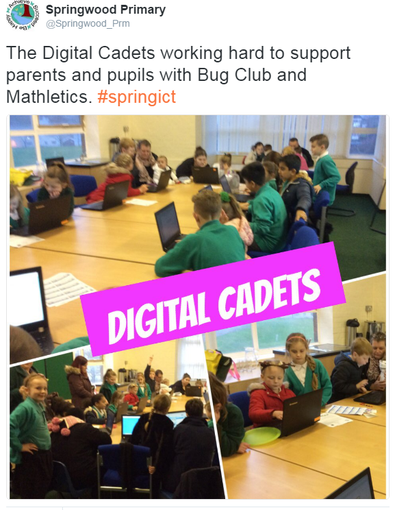 The DA agreed and Coding Club had it's debut last week for 20 children. We have been learning to code with Scratch having lots of fun. Here is an animation that Celyn made in Scratch. Next steps - Create a Xmas message from Springwood to all it's Twitter followers and families. We had an amazing time with all the parents at our ICT event. 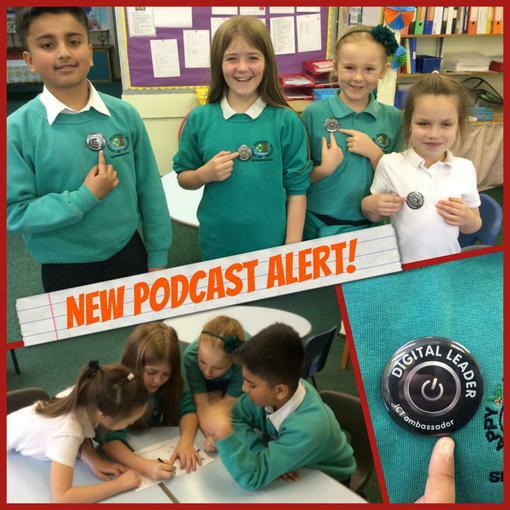 We had a Mathletics station being run by Cerys and Burhan, a coding station making a flappy bird game with Connor and Mackenzie and then we had Millie and Lola making podcasts with all the parents and children. The podcast we made is in the podcasting section of our website or click here to listen. Kole and his Dad even made a flappy bird game that was amazing too, click here to try Kole's game. Everyone loved it and we had some amazing feedback from parents and children. 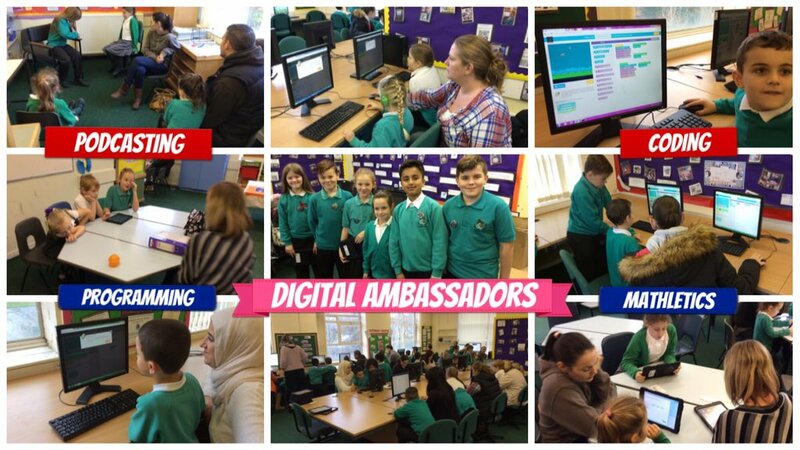 Well done Digital Ambassadors and thank you all parents for coming. Next steps - Think of how we can run a Coding club for a lunch time or after school . Our Year 6 Digitial Ambassador spoke positively about her trip to All Saints Primary where we saw Lego being used very creatively. We have decided to buy Lego kits for the school and Mr Bown will be running some sessions for this with the Digital Ambassadors and some classes. Mr Dowd told them that Mr Bown will be introducing Hwb to the school very soon and that they will be first to have training on it. We discussed the Parent ICT morning on the 10th of November and talked about what stations we will run as ambassadors. We mentioned Bug Club/Mathletics station, a Hwb station and an iMovie podcasting station. We were also very happy to receive our badges too from Mr Dowd. We also made a podcast! Here we have some year 6 and a member of the Digital Ambassadors working with All Saints Primary building and programming robots. All members and Mr Dowd. We met with the School Council. 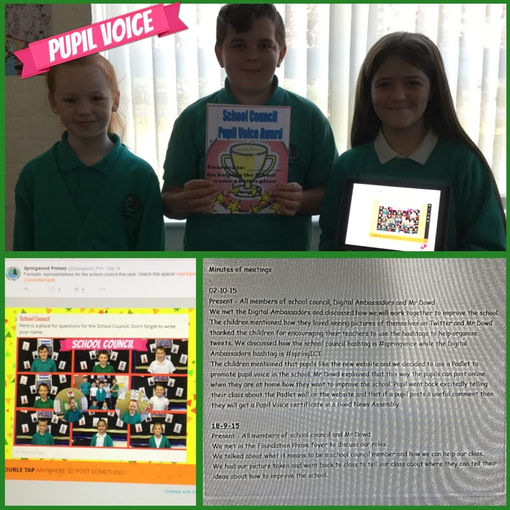 We discussed how we will work with them to promote pupil voice in the curriculum by using the Paddlet and also the podcasts. We then went and worked together using the iPads to write some questions for the school council interview on our next Podcast. 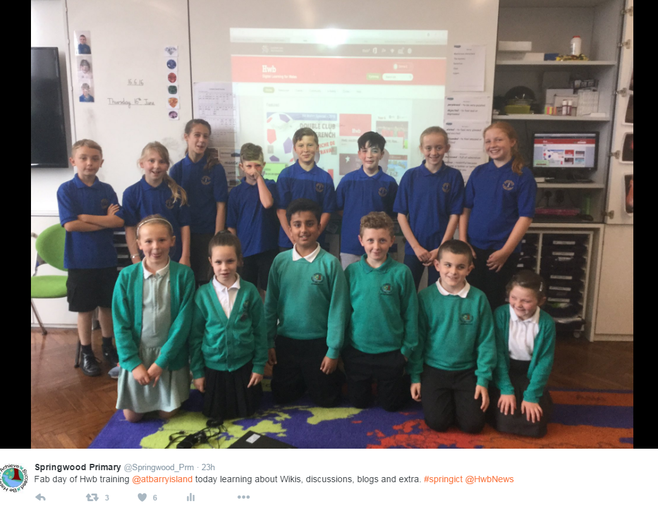 Here is a picture of us working with the school council showing the new Padlet that we helped to create to increase pupil voice in the school. There is a link to our podcast below. We discussed how we would like to work with other schools and also run and ICT event for pupils and parents. We talked about how useful it would be if we had badges too so that people could recognise us if we needed help. Mr Dowd said he would look into it. 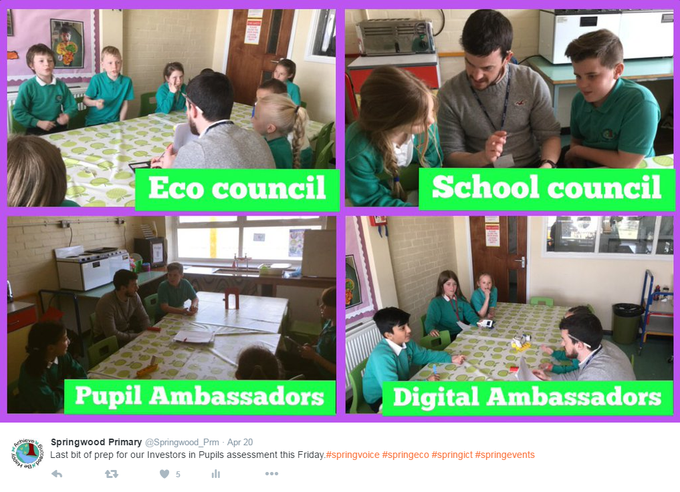 Present - All members of Digital Ambassadors, Mr Dowd and Mr Bown. We discussed what type of things we will do as Digital Ambassadors. We talked about how we will make Podcasts. 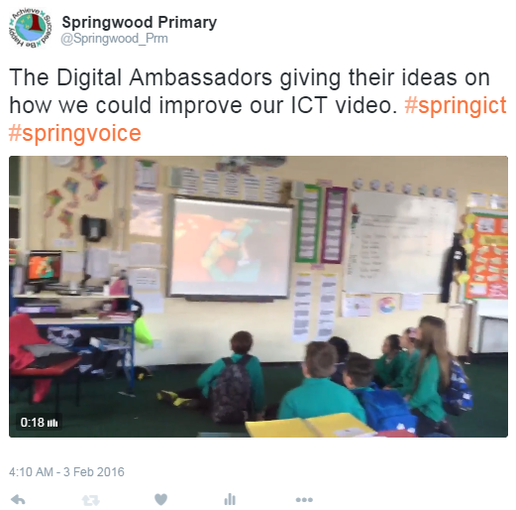 We agreed that we will promote #SpringICT with all the pupils and staff on our Twitter. We discuss how we will link with other schools to see how they use ICT. We decided that Mr Dowd and Mr Bown will help us with iPad tricks and tips that we can show our teacher and class. We also talked about how we will promote the use of our Pupil Drive in our classes. Here is an amazing video about our new yard equipment the ambassadors helped to put together.